One of the biggest challenges in once a month cooking can be keeping track of all those delicious meals that you’ve made and stored away in your freezer! Whether you use a deep freezer tucked away in the basement or a side-by-side in your kitchen, it can be a daunting task trying to remember what all you’ve made, how many meals you have left, etc., etc. Use this Freezer Inventory Sheet to help keep track of all your freezer meals, bulk meat purchases, frozen seasonal produce, and other freezer staples. By using the worksheet, you can highlight items that need to be used sooner than others and keep track of other freezer staples like frozen vegetables, bread and desserts. This ensures that all of your hard work and money don’t go to waste. No more digging through those freezer bins trying to count up what you have, or playing a guessing game with how many frozen veggies or sides you need to buy on your next trip to the grocery store! 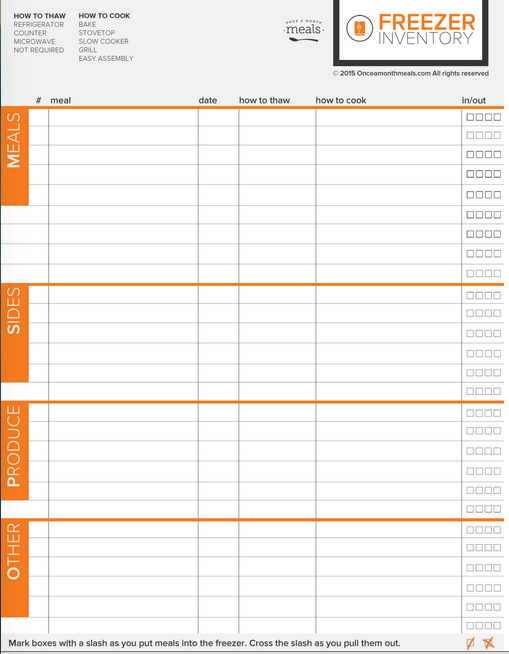 This worksheet is particularly useful when your freezer is especially full or during a busy season when you are relying on freezer meals almost exclusively. For example when you’re expecting a baby, preparing for a medical procedure, in a busy season at work, etc. It is also very useful to consult your freezer inventory before you plan another freezer cooking day. This helps you use up older meals, make room for new ones, and find any ingredients you already have that are on your grocery list, such as produce and meat that you snagged at a great price and froze for later. If you are looking for more information about how long foods and meals last in the freezer, consult this post.